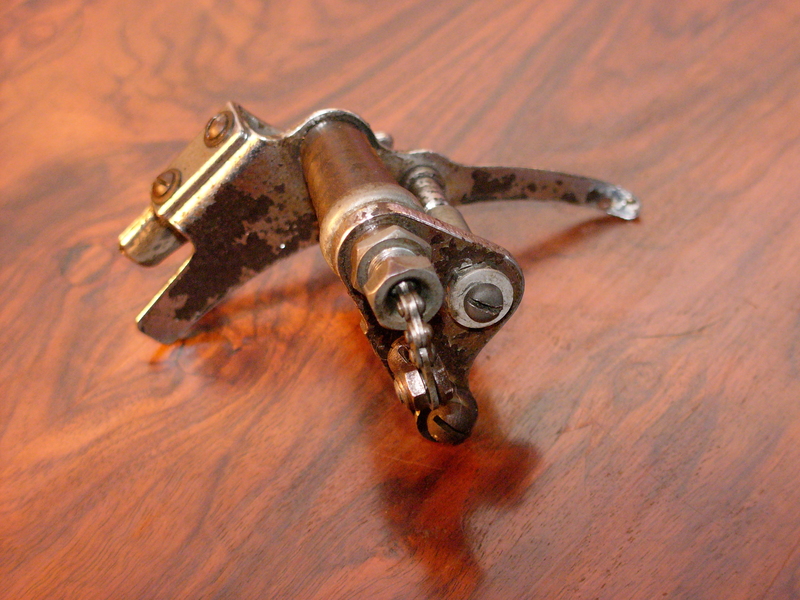 I was cleaning out one of my parts bins and discovered this unusual Simplex pull-chain front derailleur. I can’t remember the bicycle this came from, so I didn’t have any clue as to its date of manufacture. But, I assumed this piece dated from the 1950’s to 1960’s. I pulled out my copies of The Dancing Chain and The Data Book, hoping that I could spot some info about this front derailleur. But, nothing was there. 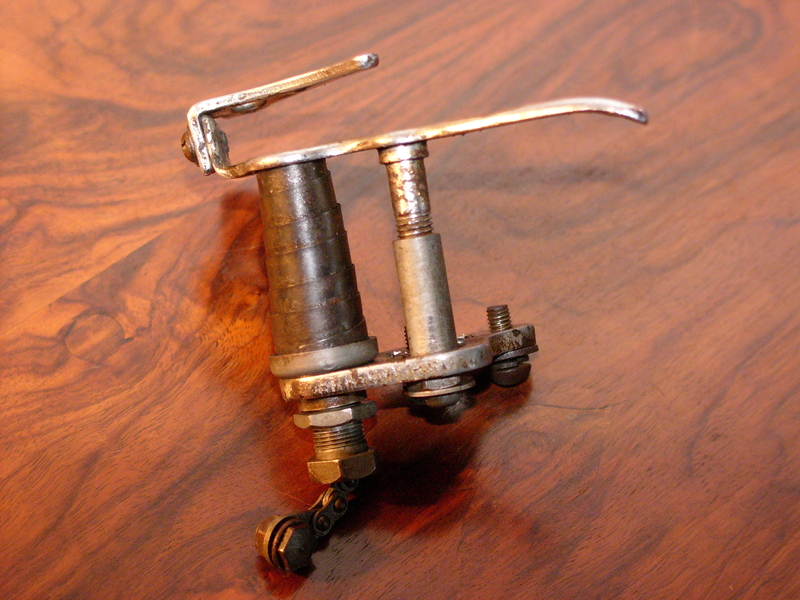 Then I did an internet search and found that a 1938 version of this front derailleur is on sale on eBay. Additionally, there are some photos on flicker featuring an earlier version of this model. 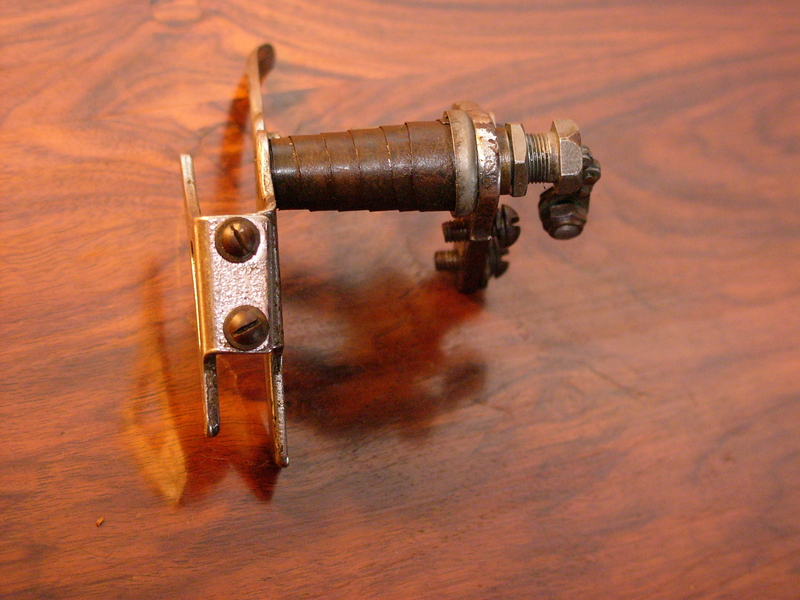 I also found what appears to be this exact model on the Velobase website – a Simplex Juy 56 front derailleur. This Simplex front derailleur features an adjustable cage for adapting to 1/8″ or 3/32′ chain sizes, effected by the two screws on top of the derailleur cage. I disassembled the derailleur for cleaning, and was able to observe the specifics of how it operates. When the pull chain is engaged by a shifter cable, the whole mechanism slides on the two cylinders which attach to the cage. One of the cylinders contains the spring system, and the other is meant to provide stability to the cage as it slides, so is rigid. 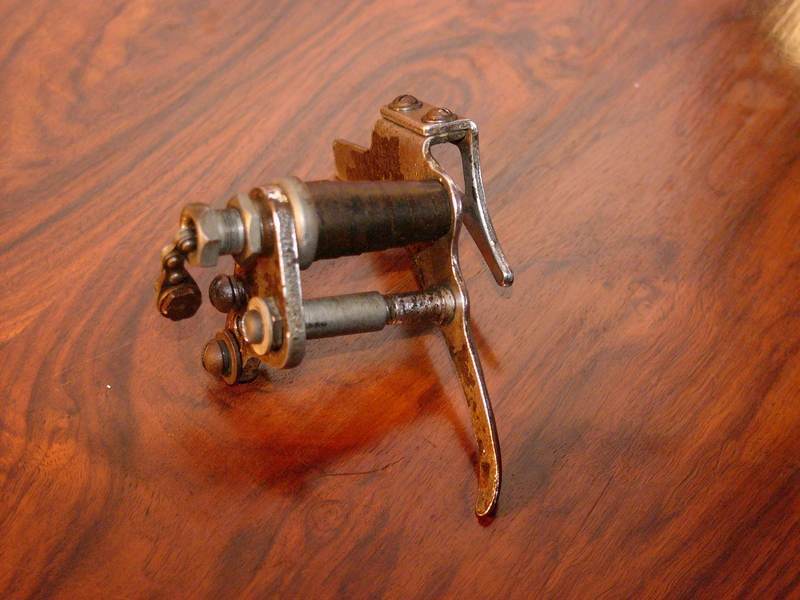 The derailleur mounts to a seat tube bracket with two bolts, shown on the left side in the photo above. 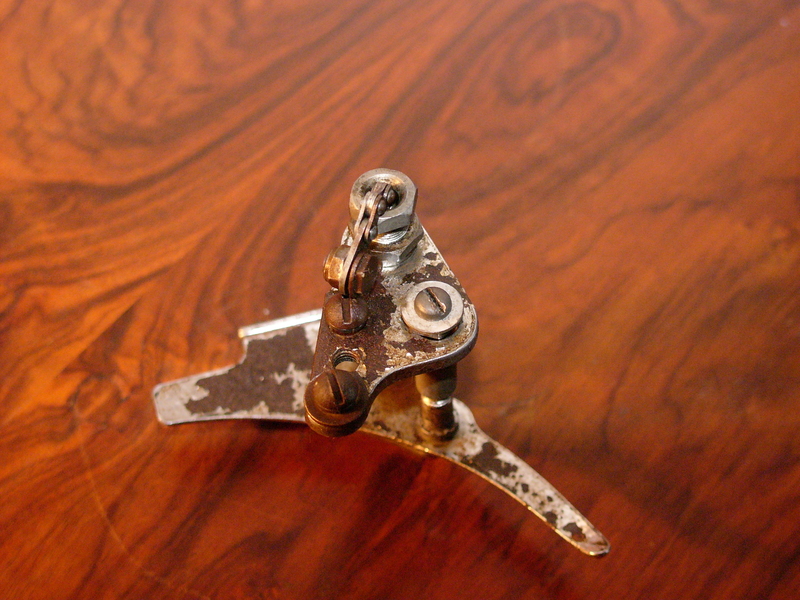 If a frame lacks such mounts, then brackets can be attached to the derailleur so that it will mount to any seat tube. The eBay model for sale today is purportedly a 1938 “NOS” version with a $475 asking price. We’ll see about that. Meanwhile, I am going to keep this front derailleur in my collection, in case something comes along that warrants its application. 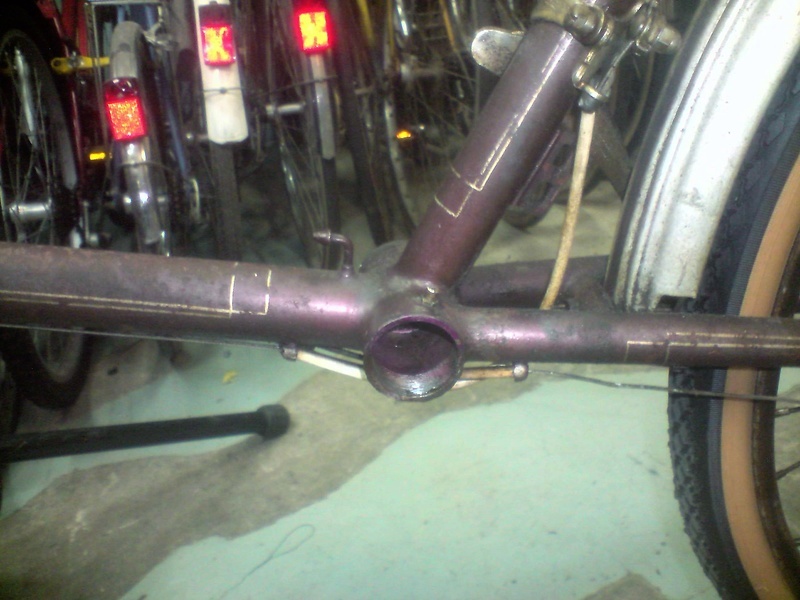 This entry was posted in Bicycle restoration, Simplex derailleur, Vintage French Bicycle and tagged French bicycle, pull-chain derailleur, simplex, Simplex front derailleur, Simplex Juy 56, vintage bicycle by Nola Wilken. Bookmark the permalink. 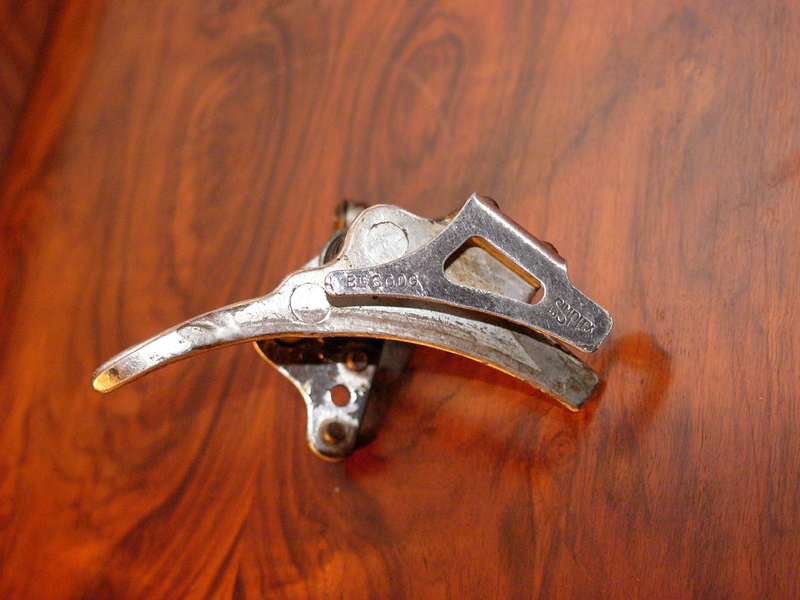 Hello I happen to need this exact derailleur for a tandem restoration. If you want to sell it, and if I can afford it, it would be great.